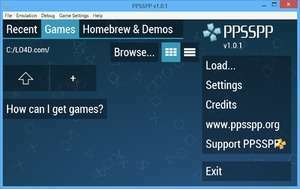 PPSSPP (PlayStation Portable Simulator Suitable for Playing Portability) is a PSP emulator which can open game files. It is available for several platforms including Android which can be found in the Play Store. The application features a modern and straightforward interface which provides you access to a file browser to search for games on your system or connected mass storage media. It can open PSP ISO files without much issue. Version 1.8.0 is a freeware program which does not have restrictions and it's free so it doesn't cost anything. For security reasons, you should also check out the PPSSPP download at LO4D.com which includes virus and malware tests. Additional screenshots of this application download may be available, too. 4.5 out of 5 based on 44 ratings. PPSSPP download been highly rated by our users.